"Our Experience Saves You Money"
Have your commercial dryers, washing machines, and other laundry equipment installed or repaired by Greg’s Laundry Equipment Service LLC in Grand Forks, ND. Also specializing in laundry equipment parts, we have been serving the needs of clients in North Dakota and Northwest Minnesota for 10 years. Our parts are genuine OEM and our services are performed by trained technicians, so rest assured that you are saving money when you hire us. Why Should You Turn to Us? 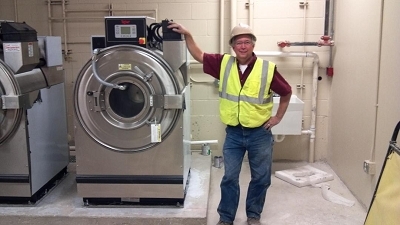 Whether you operate a hotel, hospital, nursing home, laundromat, and fitness facility business, or manage a small facility that deals with big loads of laundry on a regular basis, keeping your laundry equipment in top condition is a priority. Contact Greg’s Laundry Equipment Service LLC at (701) 775-8805 or (701) 877-8805 to schedule a service appointment today.